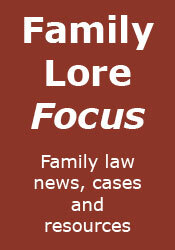 This short post is nothing to do with family law, but it is about family, and the story does begin with this blog. Back in 2011 I wrote a post here about my great-grandfather, who was killed on the Somme. The post was recently found by a distant relative of mine, who is researching his ancestry (his great-grandfather was one of my great-grandfather's brothers, who also served in the First World War, but made it home). Anyway, the relative contacted me, and we have been having an email conversation over the last couple of days, comparing notes about our shared family tree. The gentleman on the right is my grandfather, the son of the Somme victim (he was just ten when he lost his father). 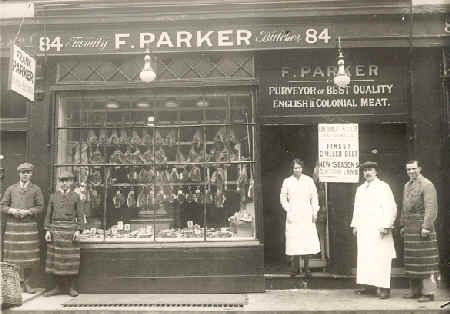 The picture was taken in 1933, outside Frank Parker's butcher's shop at 84 York Street, St.Marylebone, London. Frank is standing next to my grandfather. My grandfather bought the business from him in about 1948, and kept it until he retired in 1970. I recall as a child going to the shop every Xmas and helping my grandfather pluck the turkeys. I also recall how hard my grandfather worked - the little fingers on his hands were deformed from pulling string whilst tying up meat, preparing it for sale. Wondering what became of the shop I had a look at Google maps. York Street has clearly become a desirable area, and it turns out the shop is now a 'luxury florist', that has created floral designs for celebrities, including Madonna, Johnny Depp, Elton John, Pierce Brosnan, Roger Moore and Jerry Hall.